Newcastle based international children’s charity COCO (Comrades of Children Overseas) is celebrating a major fundraising milestone. COCO has succeeded in raising £4 million in donations since its foundation, as a result of sustained support from regional and national businesses, schools, universities, the sporting community and members of the public. We sponsored COCO’s special event in Newcastle on Thursday 7 September, where the charity thanked supporters and showcased some of the projects that have benefited from donations, outlining plans for the future. 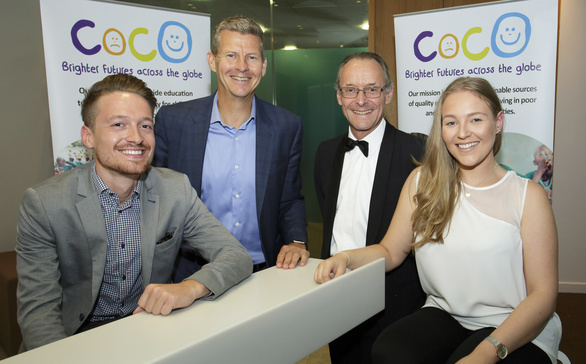 Co-founded in 2000 by world champion athlete Steve Cram CBE and Major Jim Panton, COCO has spent the past 17 years working with communities in remote regions of East Africa, helping young people access the education that can allow them to build successful futures for themselves. The charity is led by chief executive Lucy Kendall and a board of volunteers from the North East business community. COCO has supported over 50 transformational projects in 16 countries, positively impacting the lives of more than 150,000 people. By listening to, and working closely with, local communities and other partners, COCO has been able to support innovative, long-term solutions to poverty. COCO has underpinned its fundraising by establishing an extensive events programme and by building strategic partnerships with many corporate supporters and sponsors. Initiatives include sporting and other physical events such as the well-established Steve Cram Celebrity Golf Day, UK and overseas treks and cycle rides, and partnerships with major city running races such as those organised by Events of the North. More recently, the charity founded Team COCO, a dedicated ‘virtual’ running club whose members are committed fundraisers for the charity. In addition, partnerships have been established with numerous schools and universities in the region, helping to highlight the role of education in supporting people’s life chances. The fundraising milestone coincides with another of significant landmark for COCO – the three-year anniversary of its flagship project, the Schools for Life programme. Since its inception, Schools for Life has enabled 2,360 young people to access sustainable education in a safe environment, through a programme covering six key elements; shelter, power, water and sanitation, food, sports and recreation, and entrepreneurship. To date, COCO has forged partnerships with eight communities to develop Schools for Life and this month it began to work with its first school in Uganda – Fremosa Primary School in Mityana. Uganda is the third country that Schools for Life programme has reached, following its success in Tanzania and Kenya. Schools for Life builds on the success of the Hoja Project which saw the transformation of a disused tobacco factory into one of the best performing schools in Tanzania. Hoja Secondary recently achieved the best results of 185 school in its region for a fifth consecutive year. Lucy Kendall, CEO of COCO, said: “Reaching the £4 million milestone is a huge achievement for COCO and is testament to the hard work of our small team and the generosity of our many fantastic supporters. Ours is a small charity, but we make a huge difference to the lives of thousands of young people in some of the most remote and poorest regions in East Africa. We’re extremely grateful to all of our supporters for their help in enabling us to achieve this landmark. Steve Cram adds: “Little did we imagine back in 2000 that COCO would be able to make such a big difference to so many people. We have a fantastic core team, a great board and some wonderful supporters. Reaching £4 million is the result of the hard work that we have all done together and is a major achievement for a small charity, but we’ve still got a lot more to do. To find out more about the work of COCO visit www.coco.org.uk, find the charity on Facebook or follow @COCO_Charity on Twitter.